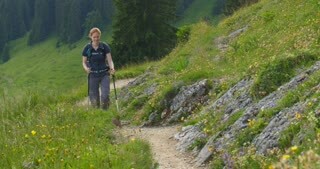 A young woman hikes with walking sticks up a mountain trail in a forest. A young woman hiking up a scenic mountain trail by sunset. 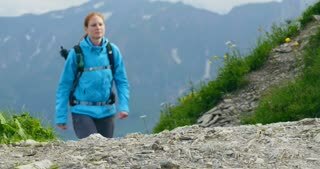 An active young woman hikes up a mountain trail in a forest. 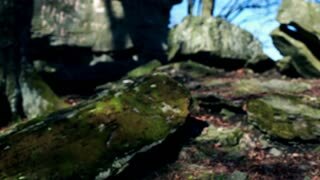 Tracking long shot of a young woman hiking alone on a mountain trail by summer. Long shot of a young woman hiking on a mountain trail. 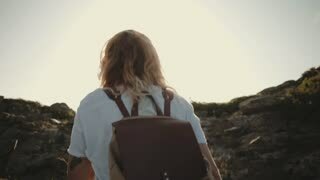 Young woman hikes alone on a mountain trail by summer. Long shot of a young woman hiking on a narrow mountain trail by summer. Young woman hikes alone on a mountain trail on a sunny summer day.